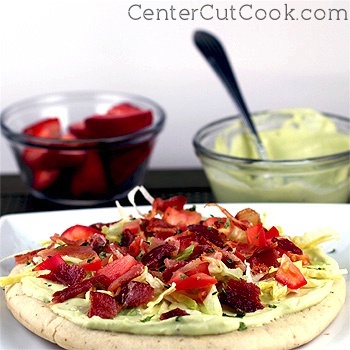 Bacon, lettuce, and tomato flatbreads are taken to another level with the addition of smooth, creamy Avocado Spread! It was not that long ago, maybe a few years, that I came to the realization that I had never tried avocados before, despite telling everybody I just didn’t like them (the color maybe?). Once I actually tried them, I couldn’t believe what I had been missing out on! Avocados cut up on salads? Delicious. In guacamole? Overwhelmingly delicious! Blended into an avocado spread, perfect for sandwiches, wraps, and flatbreads? Out of this World! Okay, I might be exaggerating a little, but avocados have been rockin’ my World lately. Last summer I started making these insanely delicious BLT Flatbreads that we ate at least two times per month. Fresh homemade flatbread got toasted in the oven (sometimes we added mozzarella cheese), then topped them with crumbled bacon, lettuce and tomatoes. A truly simple supper that we loved all summer long. When the weather started turning gorgeous in Chicago last week, I remembered this recipe and decided to make it even better this year by adding Avocado Spread- smooth, creamy, with a hint of lime and spice. Now, I had never tried making homemade Avocado Spread at home, but let me tell you my friends, it is SO easy, and SO delicious. I can already think of at least 10 different ways to use the stuff. It’s a lovely alternative to mayo on a traditional BLT, and added just the right amount of flavor to an already delicious meal. I served these BLT Flatbreads with some fresh fruit (strawberries if you wanted to know), and it was a great weeknight meal. The only thing that could possibly make this recipe even better is homemade flatbreads. I have a knock-out recipe I’ll share with you one of these days that is so simple and delicious. Unfortunately, on the particular day that I made these, planning ahead just wasn’t in the cards so we used Italian Herb flatbreads that I found at the grocery store. PS: If you haven’t cut an avocado before, this video is helpful! On a large cookie sheet, arrange flatbreads so that they are not overlapping. Sprinkle mozzarella cheese on top (optional), and bake for about 10 minutes, or until flatbreads are heated through. While the flatbreads are warming up, make the Avocado spread by scooping the flesh of one avocado in your blender or food processor. Add in lime juice, hot sauce, worcestershire sauce, sour cream, salt and black pepper. Mix until all ingredients are incorporated and you have a smooth creamy consistency (with my Vita-Mix blender, I turned it on to variable speed 3 and mixed for a few seconds to get the desired consistency). When the flatbreads are heated, spread a generous layer of avocado spread on top. Next, add shredded lettuce, diced tomato, crumbled bacon, and a dash of dried oregano.